The fuzzy math continues to play havoc with the unemployment rate, which didn’t move in spite of the best job growth in a long time. That phenomenon is validated by an unchanged participation rate still languishing in record low territory at 62.8%. Why? Because even though we had 300k+ new jobs, we also grew the unemployed number by 115k and added 69k to the line item total for “Not in the Labor Force.” In fact, the total of those reporting themselves as “Employed” only grew by 4K. Those unemployed between 1 and 26 weeks grew by a worrisome 148k, and the diffusion index in manufacturing, while still well above 50, fell by 1.2%. Wages continue just barely pacing inflation having grown just 2% since November 2013. 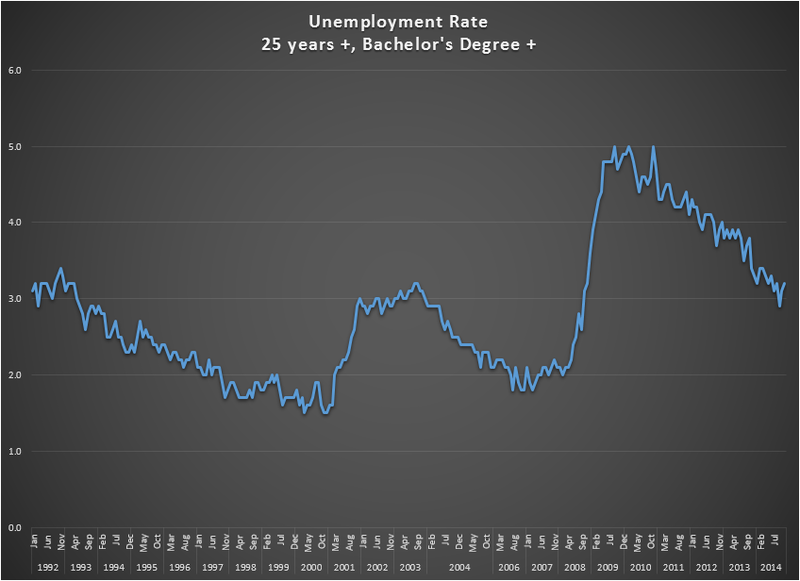 As our regular readers know, one of our “go to” metrics when assessing the true health of the labor market is the unemployment rate among those who are at least 25 years old and have a minimum of a four year college degree. 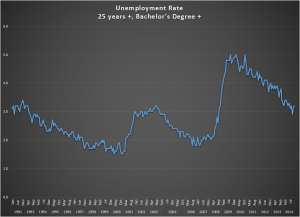 Due to their educational attainment bolstered by real world experience, this group has historically been the most bulletproof when it comes to weaker economies and unemployment. That has, unfortunately, not been the case of late so we wanted to share some perspective on how this reflects the poor economy. As of November 2014 the average unemployment rate for this group is 2.8% since the statistic has been recorded. Prior to 2008 the average unemployment rate for this group was only 2.4%. Since January of 2008 the average is 3.9%. Furthermore, this group had never gone more than 13 consecutive months unemployed at a rate of 3% or more, with a record high of 3.4%. They have now spent six consecutive years unemployed over 3% with a record high above 5%. Coincidence? We think not. Policy matters. 321k is exciting…as long as it becomes the first step in a series of improvements and not just a blip. Let’s hope some meaningful policy course changes are in the works that can render this the first step in establishing a true and sustainable recovery.